A Fresh Voice in Historical Romance! Lydia King knows what it's like to be in need, so when she joins the Teaville Moral Society, she genuinely hopes to help the town's poor. But with her father's debts increasing by the day and her mother growing sicker by the week, she wonders how long it will be until she ends up in the poor house herself. Her best chance at a financially secure future is to impress the politician courting her, and it certainly doesn't hurt that the moral society's president is her suitor's mother. Her first task as a moral society member—to obtain a donation from Nicholas Lowe, the wealthiest man in town—should be easy . . . except he flat-out refuses. 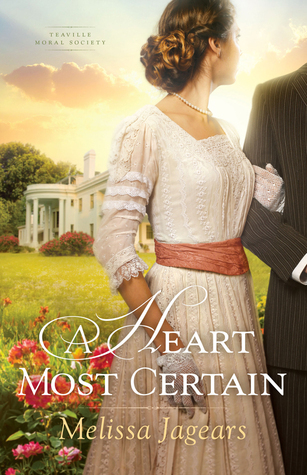 A HEART MOST CERTAIN was a story of forgiveness, mercy, sacrifice, and love. It had lovable characters, an endearing story, inspiring moments, and sweet romance that made for an enjoyable read. An enjoyable story for inspirational romance readers. I felt like this story was somewhat of a play off of Beauty and the Beast. There's bookish Lydia whose father is basically bankrupting his family with his own interests, a sick mother, and a local golden boy who is very arrogant and sought after, but who wants to marry Lydia. Then there is Nicholas who is dark, mysterious, acts much like a beast, lives in a grand house, and has very loyal staff. It was easy to draw the comparison to the classic fairy tale. As the story developed, it was interesting to see the characters develop and to get to know each other as they try to help those in prostitution who need the help or want to get out. There was some definite drama, especially as Lydia starts to change and those around her don't accept those changes, and as things come to a head. I loved Lydia's spark and intelligence and Nicholas's steadiness. There were parts where the characters didn't quite appear consistent or where some things were unrealistic, and some parts dragged slightly, but otherwise the story worked. In the end, was this what I wished for? For the most part this was a good start to this new series and an enjoyable read. I'm looking forward to seeing who the next book in the series will be about. Content: Some innuendo and suggestive references in context, but clean. Source: Received a complimentary copy from the publisher, which did not affect my review in any way. I read my first book from this author last year and loved it, so I was excited to read the first in this new series. Have you read any of her other books?